Speaking of whether tech might just be our salvation, here are two quick hits to consider. But even before he moved back to the U.S. he was mulling over his next step. Many assumed that the 42-year old technologist would continue his brilliant career in consumer electronics. He might even become a contender to run an existing multi-billion dollar business—in electronics, in mobile, maybe even Apple. Instead, he told Dani, he was going to build a thermostat. 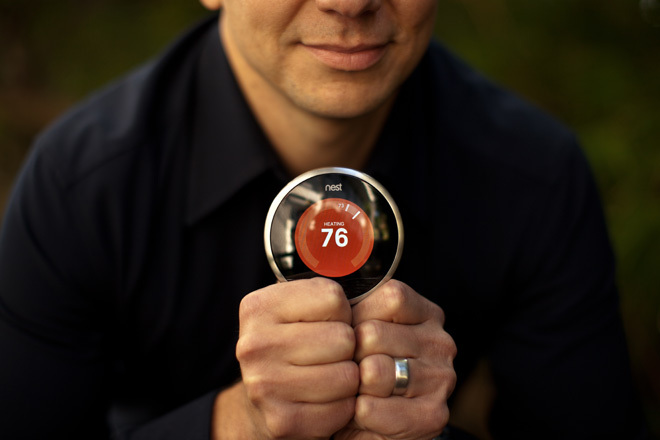 …Today comes the payoff, when Tony Fadell’s company introduces the Nest Learning Thermostat. It is available for preorder at Best Buy and Nest.com, and will ship in November. Units are already streaming from assembly lines in the Chinese factories that churn out advanced digital gadgets. The Nest is the iPod of thermostats. A simple loop of brushed stainless steel encases a chassis of reflective polymer, which encircles a crisp color digital display. Artificial intelligence figures out when to turn down the heat and when to jack up the air conditioning, so that you don’t waste money and perturb the ozone when no one is home, or when you’re asleep upstairs. You can communicate with the Nest from your smartphone, tablet or web browser. ← Electric Car = Personal Power Station?